So over in America it's almost Thanksgiving, so I thought it appropriate to share a take on pecan pie! 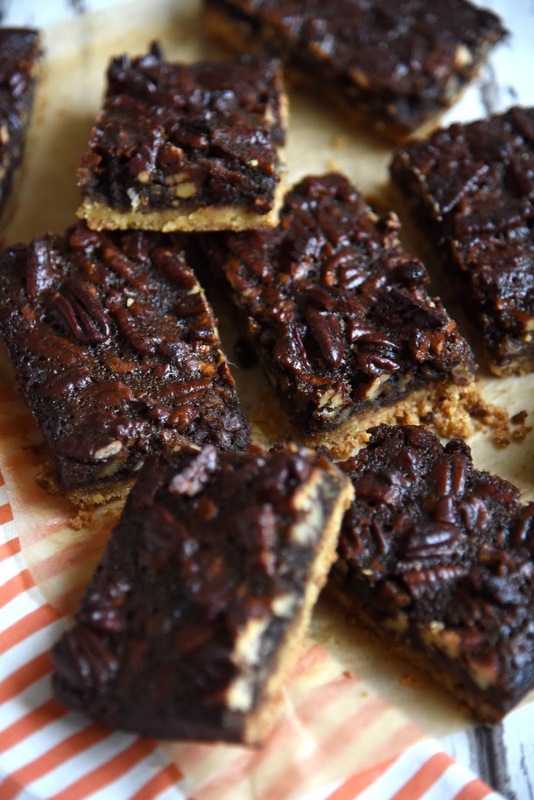 Last year I made a Chocolate Pecan Pie, so don't forget to check that recipe out! 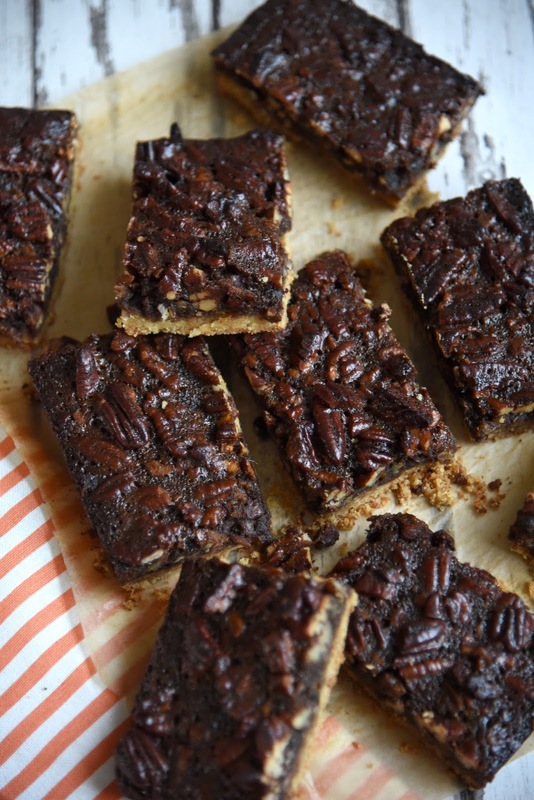 These pecan pie bars are so yummy, they have a delicious brown butter base. 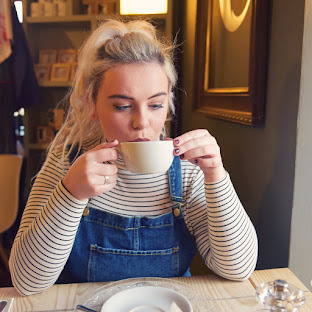 In America, pecan pie is traditionally made with corn syrup and since that doesn't really exist here mine is made from a mix of golden syrup and black treacle, which I believe is pretty similar! 1. Preheat the oven to 177°C and grease and line a 9x13 inch tin with parchment paper leaving an overhang on the sides to lift the finished bars out. Set aside. 2. For the base, cut the butter up into pieces and place in saucepan. Melt the butter over medium heat, stirring occasionally. Once melted, the butter will begin to foam. Keep stirring occasionally. After 5-8 minutes, the butter will begin to brown, you'll notice lightly browned specks begin to form at the bottom of the pan and it will have a nutty aroma. Once browned, remove from heat immediately and allow to cool for 5 minutes. 2. In a large bowl, stir the brown butter, granulated sugar, vanilla extract, and salt together. Stir in the flour until evenly combined. Press the mixture evenly into the prepared baking tin. Bake for 15 minutes. 3. For the filling, combine the butter, brown sugar, both syrups, and double cream in a medium saucepan over medium heat. Whisk to combine the ingredients and dissolve the sugar. Bring to a boil and allow to boil for 3 minutes. As it is boiling, carefully spoon 1/2 cup of the mixture into a glass measuring cup. Slowly drizzle and stir hot mixture into the eggs. Stir frequently to keep it moving so the eggs do not scramble. Once all of the mixture is added to the beaten eggs, slowly drizzle and whisk this back into the pot. The trick is to always be stirring to avoid scrambling the eggs. Remove from heat, stir in the pecans, and pour evenly over the crust. 4. Bake for 30-35 minutes. A toothpick inserted in the center should come out mostly clean. If the top is getting too brown as it bakes, loosely cover with aluminum foil. Remove from the oven, set on a wire rack, and allow to cool completely before cutting into squares.